We (Wanda, Victoria Souze, Russ Thompson and others) did several clam surveys in August and September, as part of the biological assessment for the ‘ferry landing restoration – nearshore habitat assessment’ grant. But perhaps the most fun was the one about two weeks ago when Terry Cook and Julie Hirsch spearheaded a “Beach School science field day ” with kids digging & checking out test holes along 2 ‘transects’ (parallel lines outward from the shore). 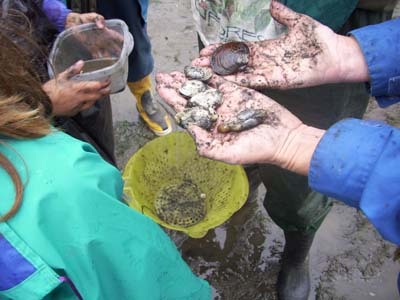 Wynne Lee, who helped as official recorder of the numbers and types of clams, worms, type of seaweed and substrate of each hole, had her camera along and has posted some of those photos, along with a brief description of the event, on her blog Lummi Island Living. Hope you’ll check it out. We’ll try to post more photos here soon. 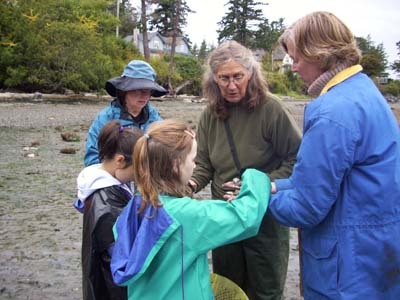 This entry was posted in Beach school, Clam Survey, clams, Grant, Lummi Island, shoreline, volunteer and tagged Clam Survey, education, Grant, Lummi Island, volunteer. Bookmark the permalink.